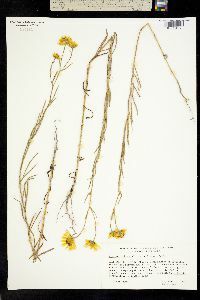 Annuals, 10-90 cm (taprooted). Stems hispid. Leaves mostly alternate; blades lance-linear to linear, 20-100 × 1-3 mm, margins conspicuously ciliate at least 3/4 their lengths, hairs often than 0.5+ mm, faces hispid, abaxial sometimes gland-dotted. Heads (1-)3-15+. Peduncles 0.5-9 cm, lengths 1/10-1/3 leafy portions of stems. Involucres 9-14 mm diam. Paleae ovate to rectangular, 4.5-5.5 mm, prominently cuspidate. Phyllaries 5.5-10 mm. Ray florets 9-15; laminae oval to obovate, 6-13 mm. Disc florets 50+; corollas 2-3 mm. Cypselae black, 1.5-2.5 mm. 2n = 16. Flowering Jul-Oct. Saline marshes and meadows; 1200-2200 m; Calif., N.Mex., Utah; Mexico (Chihuahua, Sonora). 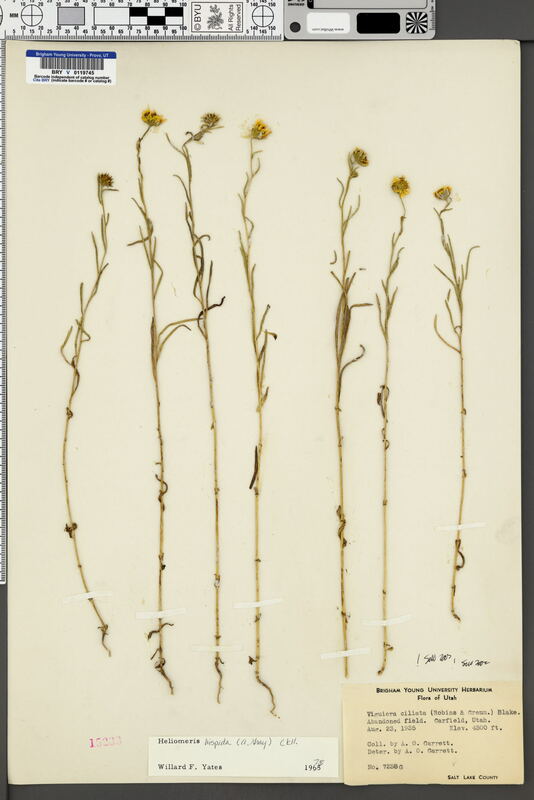 Variety ciliata has been separated based on having less dense pubescence; W. F. Yates and C. B. Heiser (1979) felt that this is insufficient for taxonomic recognition, noting that the type collection of H. hispida includes both indument forms. Heliomeris hispida appears to be relatively rare.